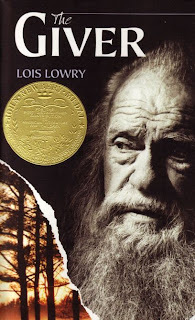 I finished reading The Giver on the heels of Lois Lowry's Provo Library presentation this week. (You can watch the video for the ProvoREADS kick-off event here.) She was on tour for the fourth installment in the series, Son, but discussed all four books. Hopefully the video of the presentation will be available soon and I'll post it here. I hadn't read The Giver before, as it was published after I left the grades it is usually read/taught in schools (I did read Number the Stars in school though). I think in many cases I'm glad to read certain books as a grown-up because I can get more out of them but because of the themes in The Giver I do wonder what my reaction would have been as a kid. I'm glad to know that it's often used in schools, though sadly it is also on the banned books list in some areas. So strange! Oh well, it takes all kinds, right? Anyway, Lois' presentation at the library was wonderful and so is The Giver. FYI: Jeff Bridges has had the rights for The Giver film for some time, but Lois said earlier this month that the financing is finally coming together for it. The Giver was also adapted into a one-act chamber opera for children earlier this year! many years ago (the cover photo is hers). He had a passion for color. (reveals many of the inspirations for the story). The Giver, The Giver series books 1-3, The Giver series book 4. The Giver is a beautifully and simply written story. It brings up several themes good for discussion such as what is the value of individuality and choice? In what ways is government involvement worth it and what is going too far? What is the value of emotions, and are some emotions too strong that they should not be experienced or dealt with at all? The tone of The Giver is unobtrusive and lends nicely to introspection and critical thinking. I can see why the book is often read in schools. I have to say though--because I know the story continues in three subsequent books--the ending felt a little incongruous with the rest of the narrative. If I didn't know there was a continuation of the story, I would have come to a completely different conclusion where the ending is concerned. I'm trying not to give any spoilers. 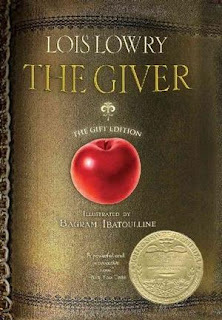 Lois said that originally The Giver was a standalone. But now it's not. I suppose what pulled me out of the story a bit at the very end was the shift from a dystopian world with a scientific base (though no science is explained) to a suddenly fantasy and cozy one. It's fine and pretty but just felt a little...like my head cocked to the side and I said "hm". And again, this was because I know there are three sequels. Otherwise I would have been like "woah" and wiped tears from my eyes. It is a wonderful book though because of its themes and writing style. I'm looking forward to finishing the series. To view the other Lois Lowry interview videos from Ad Lit, please click here.